Why would I need self storage in Sparks, NV? There are a variety of reasons why you might need self-storage in Sparks, NV. How much is a storage unit in Sparks, NV? The cheapest storage unit in Sparks, NV is $47.00 per month. What size storage units do you have available in Sparks, NV? In Sparks, NV we have sizes that range from 5'x5' to 12'x30' to suit your storage needs. How much is it for a 5'x5' storage unit in Sparks, NV? The cheapest 5'x5' storage unit in Sparks, NV is $47.00 per month. Sparks is a large city in Nevada's Washoe County, an integral part of the Reno-Sparks metropolitan area. As one of the state's largest cities, it has plenty to offer, including good job opportunities, local parks and community events. 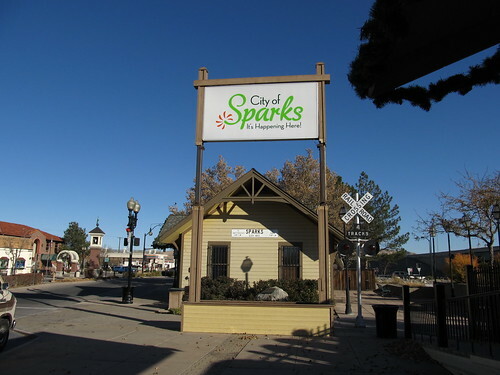 Sparks has the unique distinction of being a custom-made town created specifically by the Southern Pacific Railway Co. for its employees. When Southern Pacific took over the main line across northern Nevada from Central Pacific, one of the first tasks the company completed was to straighten the railroad to cut a few miles from the distance. This new route veered away from the town of Wadsworth, even though it had ruled the area with maintenance shops and a roundhouse for the past 40 years. That's when Southern Pacific made an impressive offer to its employees living in Wadsworth. The railroad built a new, large roundhouse and many support facilities along this new track. It also set aside a large tract of land next to the roundhouse for employees willing to move from Wadsworth. The railroad promised the employees a 50-by-140-foot lot for $1. On top of that, it also promised to pack up each employee's old house in Wadsworth and ship it to the new town, at no cost to the employee. On July 1, 1904, houses of the employees who were moving were dismantled and put on flat cars. Belongings were loaded into wagons, and trees were dug up and shipped as people moved to the new town. Once they arrived, a drawing was held to assign the new lots. Employee names were drawn from one hat, and their lot number was pulled from another. For a while, the town went by various names, including Harriman, Glendale and East Reno. Eventually, the residents decided on Sparks in honor of then Governor John Sparks. If you're considering a move to Sparks, you'll be joining a booming population. The city has grown substantially in the past few decades, attracting many people from all over the country. One of the favorite local spots in Sparks is the Sparks Marina Park, which offers a wide range of recreational activities. The park is located on a natural aquifer, providing the perfect setting for aquatic activities like swimming, windsurfing, sailing, scuba diving, boating and fishing. Surrounding the aquifer is a large park, where you can take advantage of several walking paths, sport courts, children's playgrounds and a dog park. The city is also home to the Nugget Casino Resort, as well as the Great Basin Brewing Co., the oldest brewery in the state. Every year, Sparks hosts the Best in the West Nugget Rib Cook-off, a competition based on St. Louis-style ribs and attracting tens of thousands of attendees. Washoe County School District manages the public schools in Sparks. There's also a large private Christian school in Sparks, Excel Christian School, which serves grades K through 12. Utilities: Major utility companies serving Sparks include NV Energy, Southwest Gas and the city's utilities board. Garbage and Recycling: Waste Management provides residential trash and recyclables collection services. Transportation: The Regional Transportation Commission of Washoe County (known as RTC) facilitates several public bus routes through Sparks. Driver's Licenses: You have 30 days from your arrival date to get a Nevada state driver's license. As the city grows, demand for housing is increasing, driving prices upward. The median home price is well above the national average but fairly affordable when compared to the Reno metro average. If you prefer to rent, Sparks has a wide variety of rental options to consider, including a number of apartment communities with extensive amenities. Our lowest priced units in Sparks, NV average $85.25 per month. 337 people have reserved units in Sparks, NV in the past 30 days. There are 4 locations within Sparks, NV's city limits. There is 1 location in Sparks, NV that offers AC and Heating features.